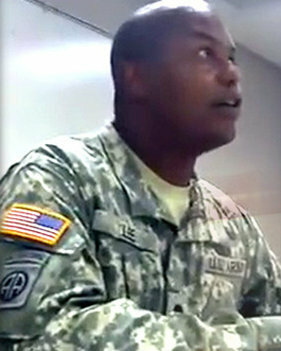 The bizarre video uploaded to YouTube features a soldier making a number of shock revelations to fellow colleagues. It was originally uploaded several years ago but has resurfaced recently on conspiracy websites. The claims are extreme and some of his fellow squaddies seem to be taking it with a pinch of salt, one asks if aliens have “fun bags”. The soldier is seen drawing three different alien races, including the small and large eyed “greys” who are common in Ufology and what he describes as their clones the “tall whites”, who were created to be servants. He described a massive war between the Reptilians and Greys and said the Greys “almost wiped them out”. Under questioning, the soldier claimed the Reptilian race were “coming to invade us but re-routed”. He said: “The thing they’re calling an asteroid which was going to destroy us…it’s not an asteroid. “It’s actually a spaceship of the reptilian race.” The exchange program in Close Encounters of the Third Kind was very similar to what happened, according to the young soldier. He referred to 12 humans who were sent to an alien planet for 13 years in an alleged secret military program called Majestic 12.